Sirio Ristorante at the Aria Hotel. Seriously. The Brooklyn Cocktail in Venice Beach. Terroni: Keeping Los Angeles Stocked with Indigenous Italian Wine. Terroni. Home to some of the world’s rarest and most autochthonous Italian wines. This restaurant is a beacon of light in a storm of predictable, dreary, and boring wine lists. Max Stefanelli is a curator of all things truly, authentically Italian- especially tireless in his promotion of the quirky and unknown enological gems of Italy. I sat at Terroni’s bar last night with my friend and fellow wine geek Andy Lynch. Not only was the food delicious, but the wine options were inspired. I chose a glass of Punta Crena Rossese “Vigneto Isasco” 2010. Rossese is an obscure red grape, found only in Liguria on Italy’s “Riviera”. This grape produces a highly aromatic, pleasantly acidic wine that is light in color and big on minerality. The Vigneto Isasco selection from Punta Crena even more so, as the vineyards are full of an iron-rich red soil. Between this and the salty-sea air component, the wine was a complete success- especially when paired with Terroni’s bean and tuna salad. The wine was served with a slight chill, which accentuated the bright, flirty flavors. This wine is a summer vacation in a glass. We also sampled the grilled octopus, served with stewed beans. The octopus was tender, with a toothsome chew. The beans provided the perfect soft, savory foil to the smoky meat. I absolutely loved the Rossese with this dish- the wine and food were made for each other. This sentiment is not altogether uncommon in Terroni- the wines are all selected carefully to balance and highlight the food. Gorgeous grilled octopus at Terroni. 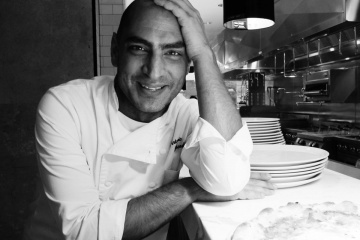 I love Terroni because Max Stefanelli and his partners have been committed to preserving their own version of Italian authenticity from day one. Max selected Erbaluce and Prie Blanc for Terroni before native Italian grapes were trendy. 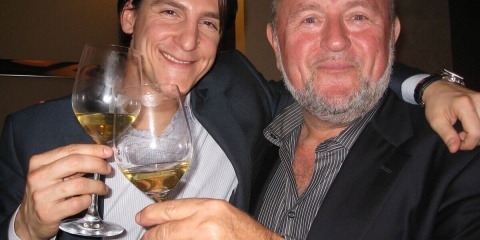 He still takes the time to educate his customers and his staff about Italian wine and wine producers. This is a labor of love. 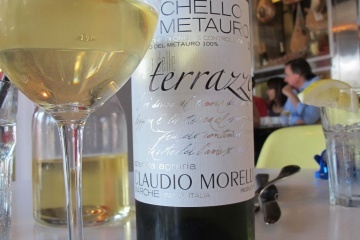 For years Terroni has valiantly battled the preconceived notion that every Italian restaurant should have Chianti, or that a restaurant in LA absolutely needs to have at least one California Chardonnay on your menu to survive. No. They do it their way- the Terroni way. Thank goodness for that. Check out this awesome online magazine the creative minds at Terroni are publishing… Fantastico! Chestnuts Roasting on an Open Fire. Or a BBQ. Orange County in November. And a Darn Good Hot Dog.